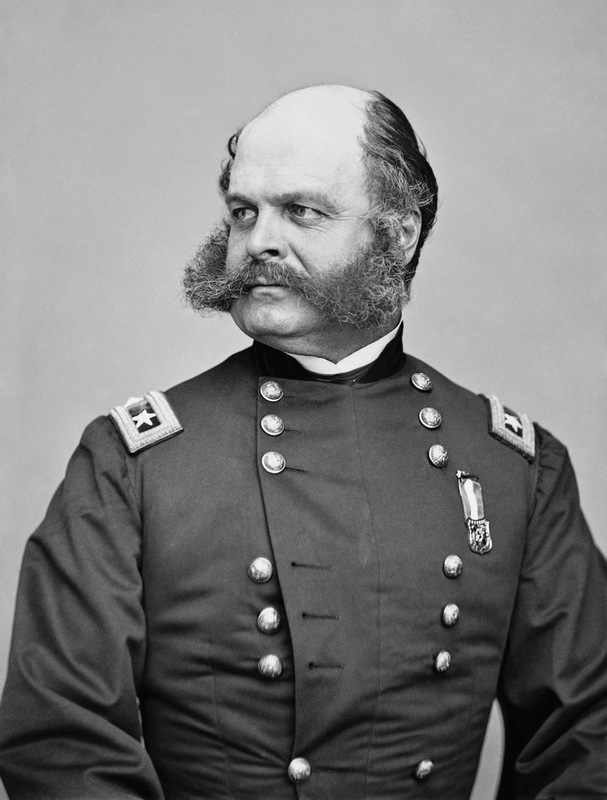 Civil War Major General Ambrose Burnside, whose unusual facial hair led to the coining of the term “sideburns”. Sideburns are patches of facial hair grown on the sides of the face, extending from the hairline to below the ears and worn with an unbearded chin. The term sideburns is a 19th-century corruption of the original burnsides, named after American Civil War general Ambrose Burnside, a man known for his unusual facial hairstyle that connected thick sideburns by way of a mustache, but left the chin clean-shaven”. Ambrose Everett Burnside (May 23, 1824 – September 13, 1881), as a Union Army general in the American Civil War, conducted successful campaigns in North Carolina and East Tennessee but was defeated in the disastrous Battle of Fredericksburg and Battle of the Crater. He was a general that history has been overly cruel towards. He had been instrumental in securing early victories for the Union on the Atlantic coast. He was a fair administrator and had a decent strategic sense. His shirt/tunic is unbuttoned at the chest because that was the style at that period. He likely has a chest pocket that he liked having easy access too. According to the etiquette of the time, to have your top jacket button buttoned was to be dressed. All of the other buttons are optional. This photo was taken by Mathew Brady, c. 1861-1865. Probably you are amazed by the resolution of this photo, a photo more than 160 years old. Why such an old photo is presented in such high resolution? Old school cameras were limited by the crystal size of the chemicals coating the photographic surface and the size of the plate of glass (and aperture, and focal length to properly expose and focus) for the negative. Mathew Brady, the man who took this photograph, was an American photographer who coordinated and sent out photographers to document the war. The process of choice at that time was a wet plate process, which used glass plates for the negatives. Glass plates could be anywhere from 3 x 2 inches (7 x 5 cm) to over 10″ on one side. A side effect of this process results in what seems to be an incredibly high resolution photograph. Many of these glass plate negatives are part of the Library of Congress and National Archive collection, almost entirely due to Brady’s efforts. The Archive and Library of Congress have graciously scanned the negatives and paper positives in their archive at a high resolution, and made the digital images available to the public.